Glow Day 2019 was a blast! We kept a couple of activities that we have done in previous glow days and added some new ones! We definitely had as much fun as the kids did! It was a great way to practice some of the concepts and skills we have been learning (addition and subtraction with number bonds, reading and writing sight words, writing to 100, engineering towers and glasses, comparing numbers, subtraction within six), and to celebrate the end of our second trimester! Glow sticks? Check! Black lights? Check! Highlighters? Check! It's time for a Glow Day in TK/K! We are SO inspired by Hope King from Get Your Teach On and @heyhopeking. She does a phenomenal job of engaging her students while focusing on rigor and content. 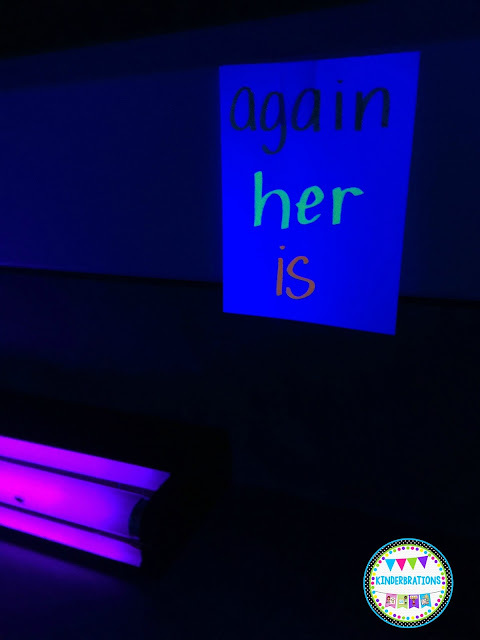 One of our favorite activities of hers is when she uses black lights and highlighters to work on close reading with her students. We took that idea and adapted it for our kinder kiddos! 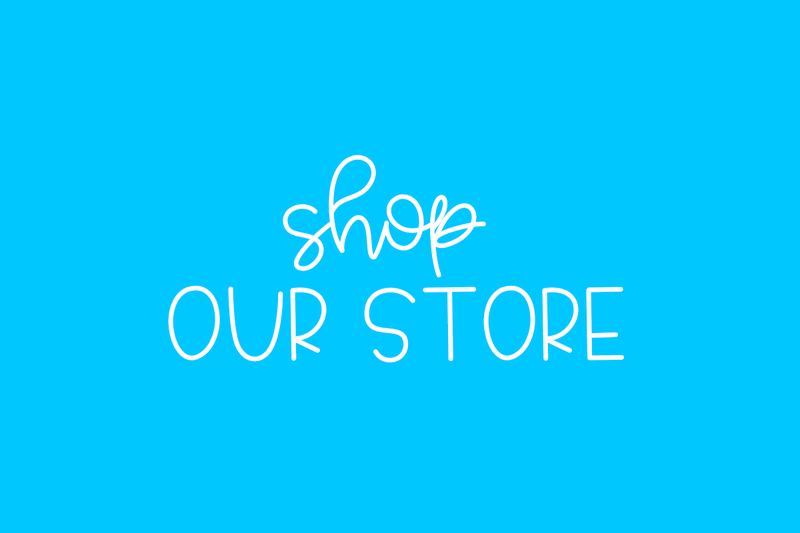 We included links to the products we used whenever we could to make it easier for you to find them. These are NOT affiliate links. We just shop on Amazon a lot! You also don't need anything other than the black lights, highlighters, and something to block out all of the natural light. We were able to add a lot of fun materials to this Glow Day because we had a Donor's Choose project funded. You do not need to use any of these for a great day. In each of the center descriptions below (when possible), we gave you an alternative that can be made easily with little to no cost. *Black Lights - We used five 24" LED black lights for our classroom (we have a big classroom, three or four would probably work as well) that we received from a Donor's Choose Project we were lucky enough to have funded. Click on the link below to see the one that we use in our classroom. *Black plastic sheeting or black garbage bags to cover the classroom windows- the thicker the better. We label ours and keep them to reuse year after year. We still have our original set that we have had for more than three years and have used at least five times. *Glow Sticks - We used about 100 for the glow stick sight word building. (We had six students in a group, but you may need more if you have more students building sight words at a time). *Highlighters (we used different colors, but yellow is definitely the brightest under the black lights) and/or invisible ink pens (click for link Invisible Ink Pens). *Battery Operated Tap Lights - We bought these from Walmart. They were four for about $4.00. This brings a little bit of light into the room. We put ours next to activities that needed a little more light like the writing to 100 and reading with the finger lights. 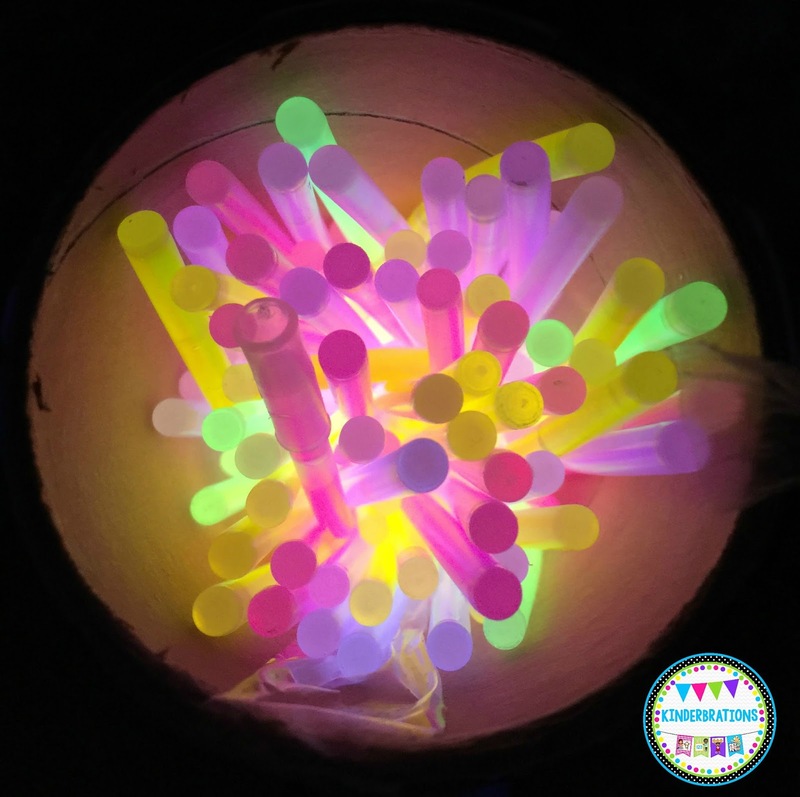 For Glow Day 2019, we added some new activities and a few more materials. We have included a description of the materials and the link (when possible) in the center explanations. Before "Glow Day," we sent a note home to our students asking them to wear white or neon. At school, we gave them plastic neon fedoras (Click Here for Link) to wear for the day. Of course, we had white on and wore a neon hat as well. The kiddos could hardly wait to come to school to see what exciting thing we had planned for them! 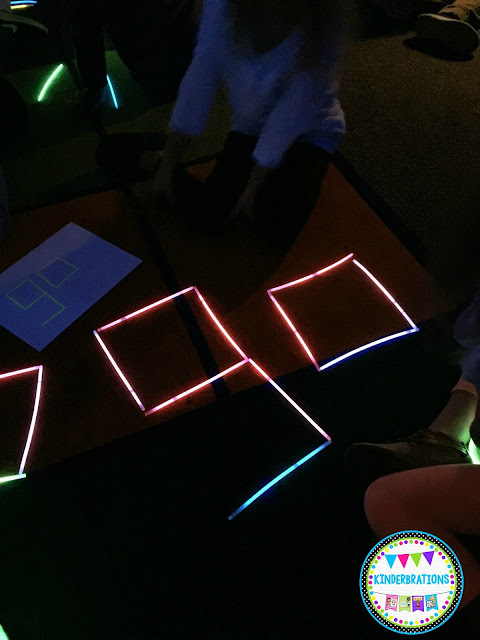 Room Set Up: We covered all of our windows with black plastic sheeting (black garbage bags work too), spread our black lights around the room, hung a few glow in the dark balloons on our white board, and wrote "Get Your Glow On" on our smart board using bright colors . That was it!!! The black lights made everything look amazing! We rotated through four centers the first time we did this. This last time we rotated through eight different activities. Each rotation lasted about 12 to 15 minutes including clean up and transitions. Since most of the centers are open ended, the rotation time can be adjusted as needed. We have included ten center ideas. Pick and choose whatever you need. You can easily add more. Have your students complete a recording page using a highlighter or add glow in the dark manipulatives or materials to practice a math concept or create an engineering project. Sight Word Building with Glow Sticks: We used a 100 pack of glow stick bracelets. We kept them straight and the students built the words like we had on the cards. We wrote the sight words on index cards using highlighters. We wrote the letters with all straight lines, so that the students would have a model to build from. We were able to differentiate this center by writing the sight words in a different color of highlighter for each reading group level. For example, we have a group of kinder students that are working on the first grade sight word list. We chose some of those first grade words and wrote them in neon pink highlighter. Another group of students are working on kindergarten sight words, and those words were written with a yellow highlighter. They absolutely LOVED this center!!! We had some students not want to take their words apart, so we added a few more glow sticks. That way they could keep building words! 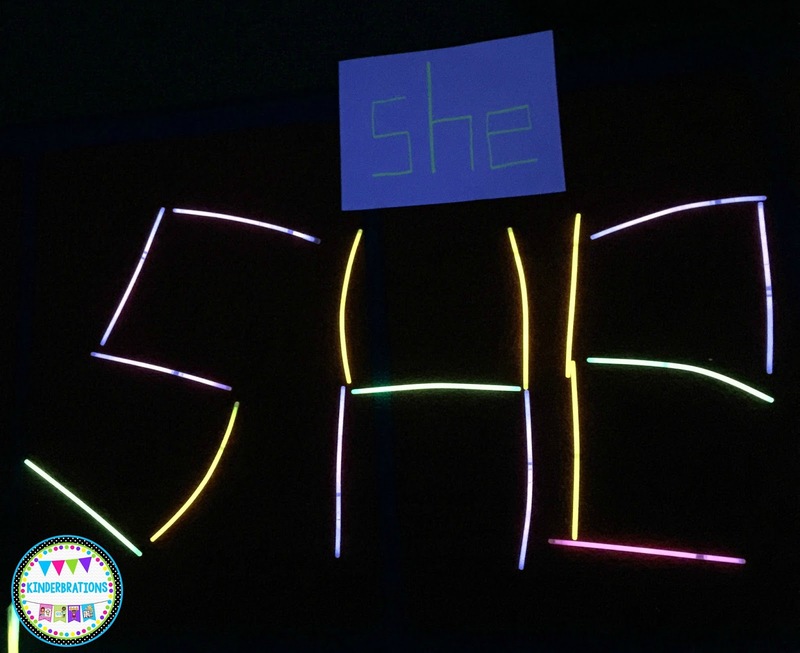 Building sight words out of glow sticks. 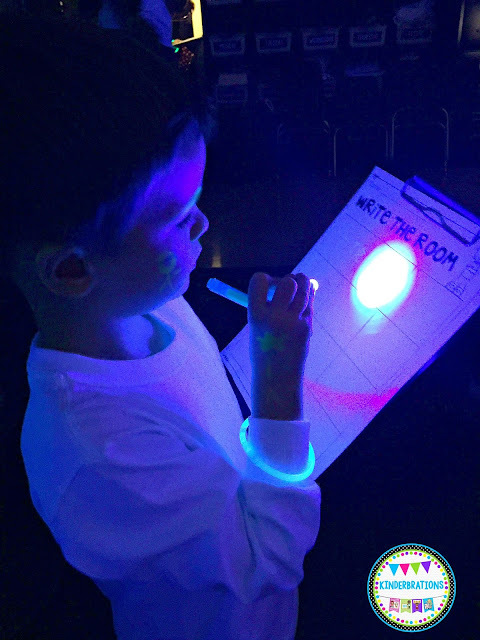 "Glow" Write the Room: We differentiated this center as well by writing sight words for the different levels in three different colors of highlighters. Each group knew which color their words were written in and whether those words were on the top, middle, or bottom of the word card. We taped the words around the room and gave each student a clipboard and a highlighter or an invisible/spy ink pens (see link above). The students walked around the room and hunted for their sight words, read each word, and then recorded the words in boxes on their recording sheet. Click here for the link to the recording sheet freebie. You can print two and run them back to back if you need more than 12 places for the students to record. They loved seeing their words glowing under the black lights! The invisible ink pens have UV lights on the end! Highlighters work great too! Read, write, read! Differentiated by writing sight words for each reading group level using different colored highlighters. 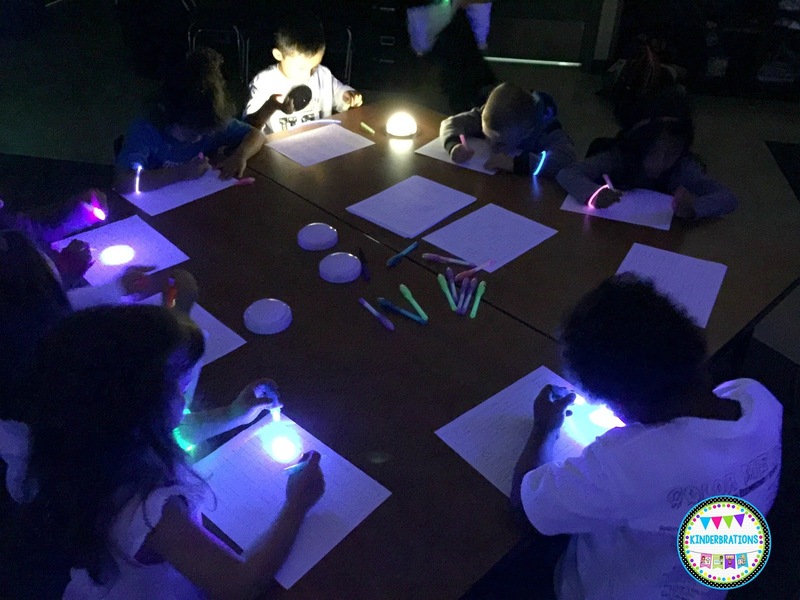 Glow Writing: The students were SO engaged as they wrote letters, words, and sentences. They had the choice of using highlighters or invisible ink pens. We also had tap lights out on the table in case they wanted to have more light. You can find tap lights at the Dollar Store or Walmart. 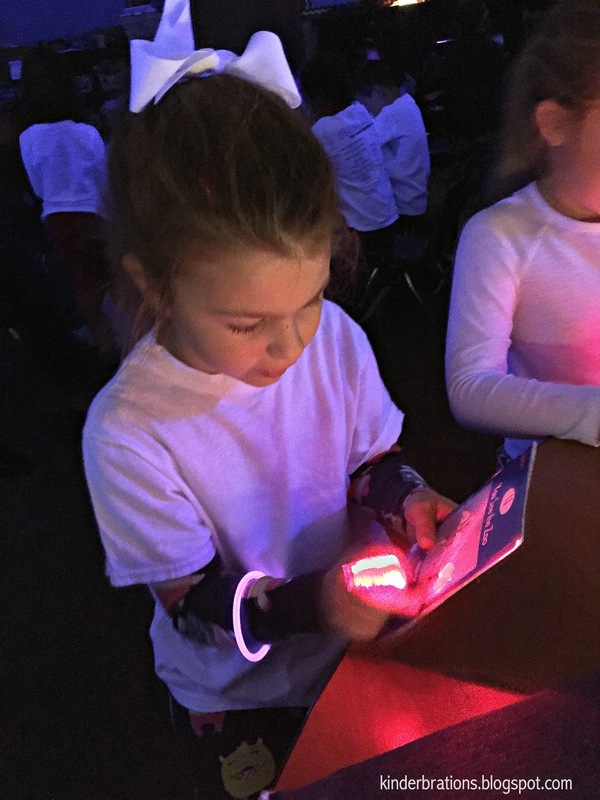 Book Bag Reading with Finger Lights: They read books from their reading bags and used little finger lights to follow along (link below). Number Bonds: We made a number bond on the carpet using glow in the dark tape and used glow in the dark mini discs and glow in the dark dice to practice composing and decomposing numbers to 12 using the number bond. The students randomly chose a whole or part card (we wrote these with a highlighter on white construction paper). If they chose a whole card, they rolled one or two dice (that is how we differentiated the center). Then, they used the glow in the dark mini discs to build the whole number. They then used more glow in the dark mini discs to decompose the whole number into parts. They continued to decompose the whole number until there were no available combinations left. If they chose the parts card, they rolled two dice to see what the two parts would be and built them using the mini discs. They then added the two parts to determine the whole. You could always add a recording sheet or have the students record the number bonds they build (picture or numbers) on whiteboards with fluorescent whiteboard pens. Glow To 100: Students used the invisible ink pens or highlighters to write to 100. We provided a 100s chart for them to use if needed. Glow writing to 100 using invisible ink pens. Highlighters work too! Glow Top It: Working in pairs or in a small group against an adult (depending on student need), students use glow in the dark cards (could just write numbers and/or shapes on index cards with a fluorescent marker) to play a game of Math War or Top It. Each child turns over one card at a time. The player with the highest number wins the "battle" or round. That player gets to keep the cards. If both players turn over the same number, they have a "war" or "battle" by each placing three cards face down. Then, they each flip over the top card and compare the numbers. The player with the highest number wins all of the cards. The game can continue until one player has all of the cards. You could also make the game with addition, subtraction, multiplication, or division math facts. Glow Sensory: We had three different sensory stations set up: glow in the dark sand, glow in the dark slime, and glow in the dark play dough. The kids LOVED the sand; however, after cleaning it up, we will probably not do it again!!! It ended up everywhere! They explored the sand and the slime, and they stamped sight words into the play dough. We wrote sight words on strips of paper using highlighters and differentiated the activity by writing different lists of sight words using different colored highlighters. The students then used stamps (we used regular alphabet stamps, but dough stampers would have been great too) to stamp the sight words into the play dough. The kids could have also written in the play dough with a pencil. Stamping sight words into glow Play Dough. We probably won't do glow in the dark sand again. Glow in the dark sand - They had the best time! We really meant it when we said that it was everywhere! They loved it! Glow Cup Tower Engineering: We gave the kids 100 plastic black light plastic cups and challenged them to make a wall and or tower as tall as they could. This was absolutely one of their favorite activities. It was great listening to their conversations as they worked together to design and execute their plan. We didn't try it, but we think white plastic cups would also glow under the black lights. Glow in the Dark Bowling Subtraction: The students took turns bowling and then subtracting how many bowling pins were knocked down to determine how many pins were left standing. Although only one student bowled at a time, each student recorded the subtraction sentence. Click here for the link to the recording sheet freebie. You can print two and run them back to back if you need more than 12 places for the students to record. We varied how many bowling pins they started with, so that there would be variation in the subtraction problems. We used a light up bowling set we got from Amazon this time; however, you can use water bottles with a glow stick in them as well. They work best with water in them so that they do not fall over easily. We have used water bottle bowling pins in the past and they work just as well. We also did a fun whole-class STEM activity. After reading the book Iggy Peck, Architect, students used neon straws and marshmallows to try to construct the tallest tower. 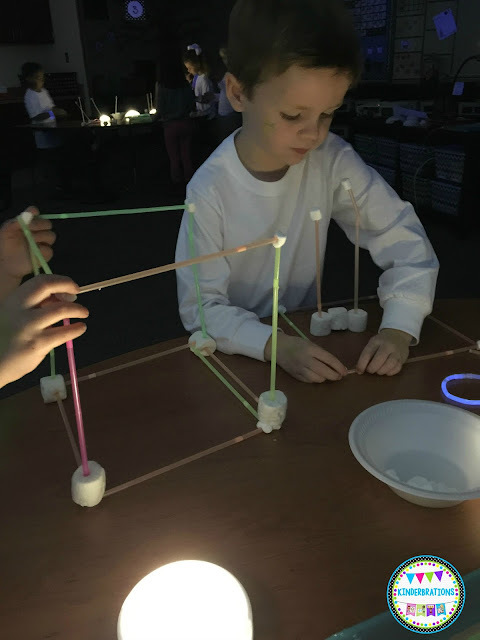 Next time, we will use larger marshmallows or Playdoh and maybe even glow sticks for building. The straws worked pretty well but didn't glow as much as we thought they would. Glow sticks would be even better! Glow Day 2.0 was just as amazing as our first Glow Day! The kiddos had a blast and were completely engaged in every activity! What a great way to review and practice skills. We can't wait for Glow Day 3.0! The possibilities are endless! St. Patrick's Day Mystery- Welcome to the Shamrock Detective Agency! Welcome to the Shamrock Detective Agency! Our detectives were highly engaged as they solved the Case of the Tricky Leprechaun through math, literacy, science, STEM, art, and more! Creating the Magic: The students walked into a crime scene where Finnegan O'Malley, the leprechaun, had ransacked the classroom. They had to uncover clues that would hopefully lead them to the capture of that tricky leprechaun. Our students received their detective badges and became part of the Shamrock Detective Agency. The "detectives" immediately began working through different investigations to uncover clues in order to lead them to the tricky leprechaun. Building the Excitement: We read several leprechaun books in the days leading up to St. Patrick’s Day, so that the students would be familiar with how mischievous and tricky leprechauns can be. Our favorite book to read on the day before St. Patrick’s Day is How to Catch a Leprechaun by Adam Wallace. It’s the perfect set up for what is going to happen the following day. We also sent the students home with a “Breaking News” note for their parents to read to them the day before St. Patrick’s Day. If you are still looking for ideas for the 100th day of school, or you're collecting ideas for next year's 100th day, check out this blog post over on the TPT blog. They have gathered a collection of practical and engaging learning activities and resources sure to make your 100th day of school a day to remember. You may even see our two favorite 100th day adventures, Construction Day: Building to 100 and 100th Day of School Mystery: Rescue Zero the Hero, featured. ~wink-wink~ If you want to learn more about either one of these fabulous days, see our blog posts below. We are ready for our day! Welcome to the 10x10 Construction Company! Building our way to 100! 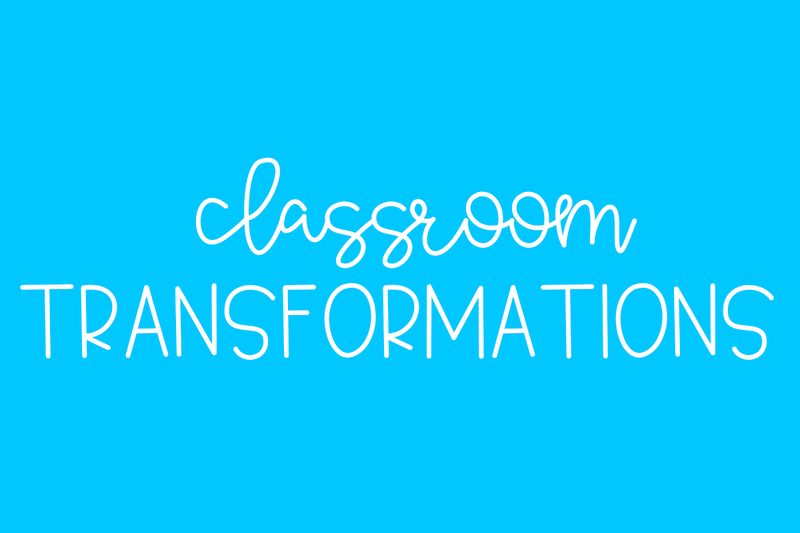 We have to start off by saying that much of our inspiration for this room flip (transformation) and all of our room flips come from Kim Bearden (co-founder of The Ron Clark Academy) and Hope and Wade King (educators from the Ron Clark Academy). 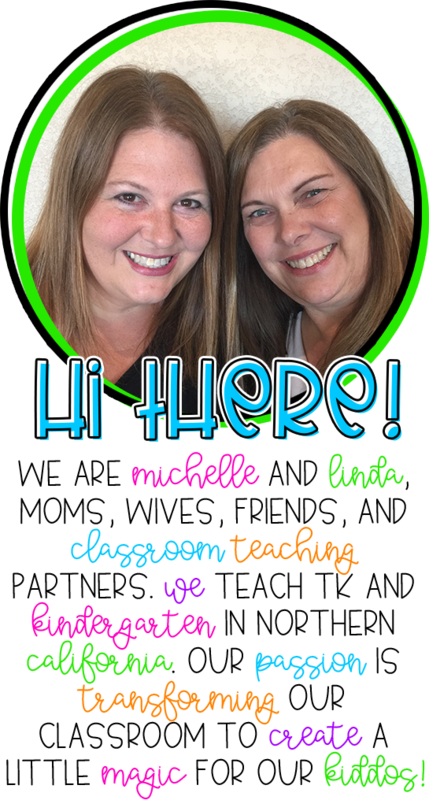 They have truly inspired us to find ways to make our teaching full of rich and rigorous content and incredibly engaging. Our kiddos are always so engrossed in their learning during flip days like this. 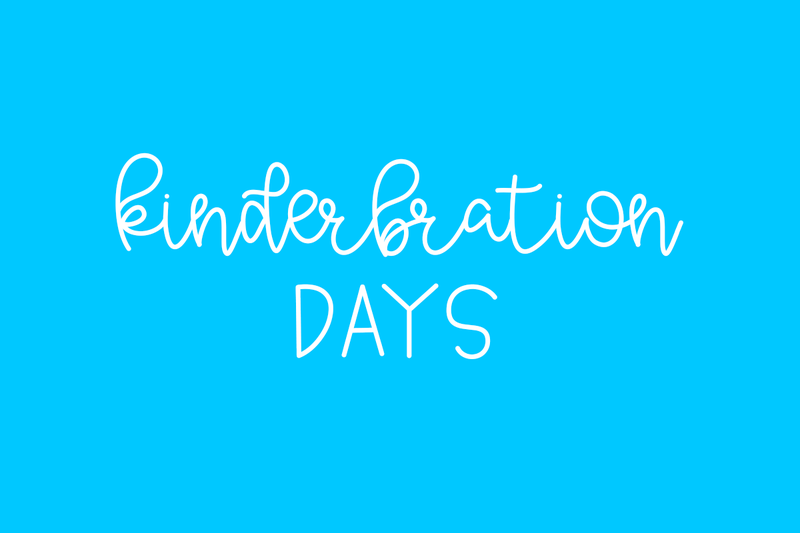 We teach a transitional kindergarten/ kindergarten combo class, so we are always looking for different ways to celebrate special days. Since we have some of the same students two years in a row, we don't want to repeat any celebrations. We rotate what we do for 100's day (and other special days) every year so that it isn't a repeat for any of our students. Last year, we did our 100's Day Mystery and it was one of the BEST. DAYS. EVER!! We knew that we wanted to try and create something as unique and engaging, so Construction Day was born. Our "construction workers" spent the 100th day of school building to 100! This could actually be done anytime of the year to reinforce numbers to 100. Father's Day- It Only Takes a Minute to Make a Memory! We wanted to do something special for our kiddos' daddies (or special person) for Father's Day. We have done a couple of different things in the past, but none of them were as engaging as our "It Only Takes a Minute to Make a Memory" Father's Day celebration. Just look at those faces! We set up different "Minute It to Win It" games we found on Pinterest. We have said this before, but seriously folks what did we do without Pinterest? We chose games that we thought the dads would have a good time doing. Some were a little silly, and we wondered if some of the dads would really do them. BUT, every "dad" did every single one! It was hilarious and precious all at the same time. We kept it super simple, but it was so amazing seeing the kids interact with their special person. We were lucky and were able to get someone there for almost every student (dads, grandpas, uncles, friends, older brothers). We had the dads RSVP so we knew ahead of time who would not have someone. Then, we paired up those kiddos with other dads (we asked ahead of time). It worked out SO well. There was nothing but happy faces! My Mom is a STAR! The entrance to our classroom! ***Please disregard our submarine door and pier piling posts. We were in the middle of studying the ocean, and we turned our room into a "submarine!" Last year, we decided that we wanted to do something a little bit different for Mother's Day. We have always made sweet presents to send home, but we wanted to make the moms feel extra special. SO... we rolled out the red carpet and did a special Hollywood-themed Mother's Day! The first step was to have the kids take home an invitation to give to their mom or other special person (grandmas, aunts, big sisters - we even had one dad) couple of weeks before the event. We wanted to give everyone enough time to make adjustments to their schedules, so they could attend. We had a couple of moms "adopt" an extra kiddo too. We made sure every student had a special person with them.